Dr YSRHU Ph.D Horticulture Entrance test 2018-Dr YSR Horticultural University: Dr YSR Horticultural University has published the Ph.D Horticulture Courses Admission 2018 notification and applications are invited for admission into Ph.D(Hort.) - with specialization in Fruit Science , Vegetable Science , Floriculture and Landscape Architecture and Plantation, Spices, Medicinal and Aromatic Crops candidates with M.Sc.(Hort.) degree. 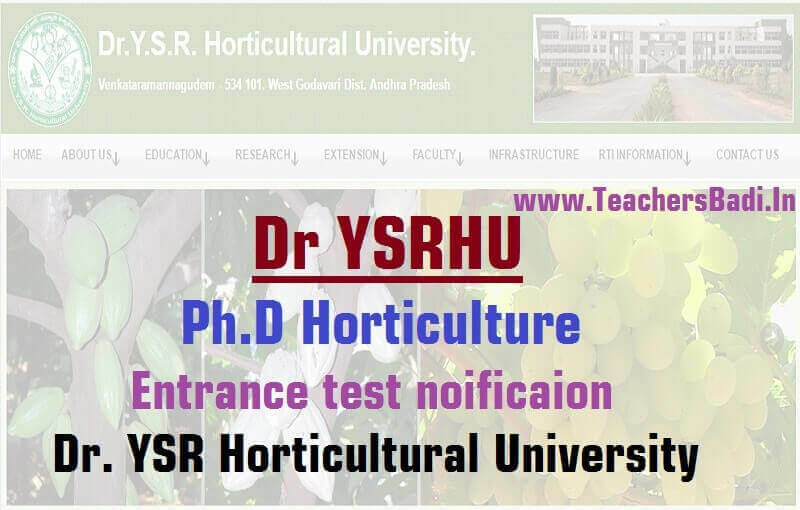 online application form, Selection procedure, last date for apply, hall tickets, exam date, results, counselling dates and certificates verification dates are available at Dr YSRHU web portal. ప‌శ్చిమ‌గోదావ‌రి జిల్లాలోని డాక్ట‌ర్ వైఎస్ఆర్ హార్టిక‌ల్చ‌ర‌ల్ యూనివ‌ర్సిటీ 2018-19 విద్యా సంవ‌త్స‌రానికిగాను పీహెచ్‌డీ ప్రోగ్రాముల్లో ప్ర‌వేశాల‌కు ద‌ర‌ఖాస్తులు కోరుతోంది. వయఃప‌రిమితి: 01.07.2018 నాటికి 40 ఏళ్లు మించ‌కూడ‌దు. ఎంపిక విధానం: అక‌డ‌మిక్ ప్ర‌తిభ‌, ప్ర‌వేశ ప‌రీక్ష‌, ఇంట‌ర్వ్యూ ఆధారంగా. ప్ర‌వేశ ప‌రీక్ష తేదీ: 2018 ఆగ‌స్టు 07, 08 తేదీల్లో. వేదిక‌: College of Horticulture, Venkataramannagudem, West Godavari District. ద‌ర‌ఖాస్తు ఫీజు: జ‌న‌ర‌ల్/ ఓబీసీ అభ్య‌ర్థులకు రూ.500, ఎస్సీ/ ఎస్టీ/ పీహెచ్‌సీ అభ్య‌ర్థుల‌కు రూ.250. చిరునామా: The Registrar, Dr.Y.S.R. Horticultural University, Administrative Office, Post Box No.7, Venkataramannagudem, Near Tadepalligudem - 534101, West Godavari District. Candidates seeking admission into Ph.D in Horticulture must have passed in M.Sc. (Horticulture) with minimum of 6.50/10.00 OGPA from ICAR Accredited University. Age limit: The upper age limit is 40 years as on 1st July, 2018. The Selection shall be based on the previous academic record (M.Sc.(Hort.) - 30%, B.Sc(Hort.) - 10%, and performance in Entrance Test (50%) and 10% for interview. Candidates with 50% or more than 50% marks in entrance test are eligible for interview/counseling which is relaxable in case of SC/ST candidates to the extent of seats reserved for them. The entrance test will be objective type for 200 marks, with 100 marks from specialization in horticulture and 40 marks from compulsory Biochemistry and statistics courses and another 60 marks from general horticulture. Every downloaded online application should accompany DD drawn in favour of “Comptroller, Dr.YSRHU, payable at Tadepalligudem” for Rs.1000/- for Ph.D(Hort.) for general category and in case of SC/ ST/PHC candidates Rs.500/- respectively along with two self addressed envelopes with pin code affixing postage stamps of Rs.5/- on each. Applications duly filled in together with Demand Draft and all the prescribed certificates should be sent to “The Registrar, Dr.Y.S.R. Horticultural University, Administrative Office, Venkataramannagudem, Near Tadepalligudem, 534101, West Godavari District on or before .......2018.” All the eligible candidates in P.G.Entrance Test should bring their original certificates at the time of counseling. Horticultural College & Research Institute, Venkataramannagudem, West Godavari District.